Walnut Avenue Ranch | Northern California | Candy Factory, Ornamental Gardens include: Cacti, Lilacs and Iris. 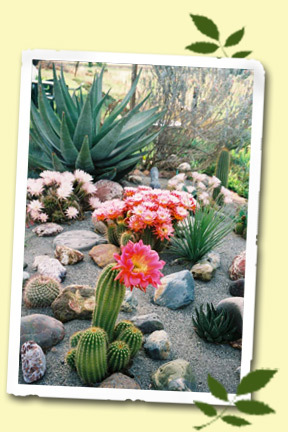 As a leisure activity, we also maintain extensive ornamental gardens around our factories – our visitors find the unique cactus and rock gardens of particular interest, especially in the spring when the cacti, lilacs, and iris are in bloom. Tours are a popular activity, especially for garden clubs, travelers, and school and agritourism groups. Visitors can wander the lovely gardens, noting the historic windmill and pump house, tour the candy factory and see how our delicious confections are made, or learn how the hard black walnut is cracked on our demonstration cracking machine. Enjoy a country drive and visit our ranch during open hours, or give us a call and arrange a special tour.